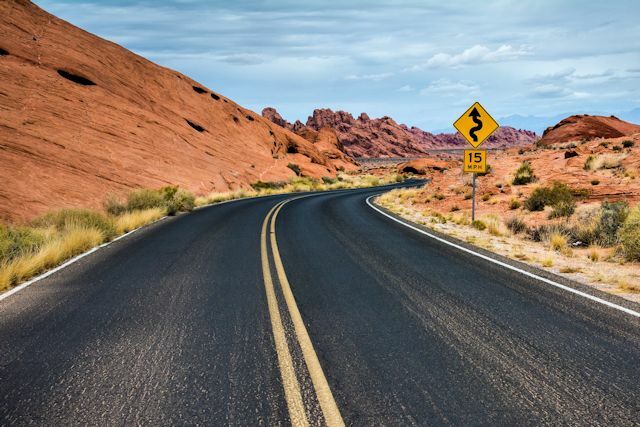 On Tuesday, we left Lordsburg, heading south on NM-80, which transitions to AZ-80 at the state line, tracing the old US-80 in a diagonal slash across Arizona's southeast corner through a rugged landscape of sagebrush plains surrounded by rocky mountains and volcanic escarpments. Scattered residences appeared well off the highway, and cattle guards periodically broke up the road, reminding us we were in open range country. SEARCHING FOR A LETTERBOX POINTED US TOWARD THIS SCENIC LOCATION. 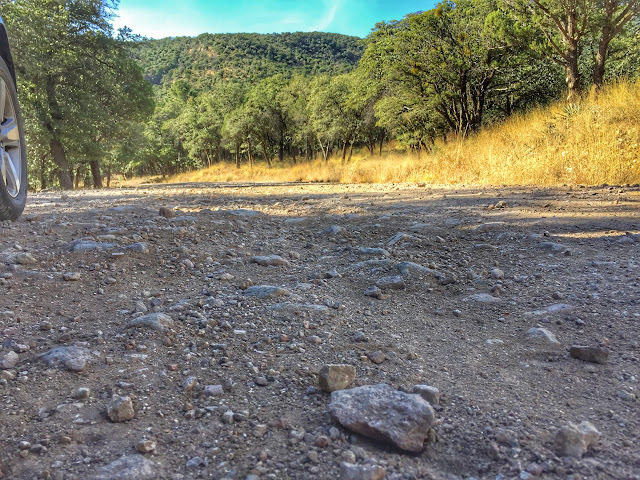 Following Forest Road-42, we sidetracked off 80 to a dusty crossroads named Portal (pop. 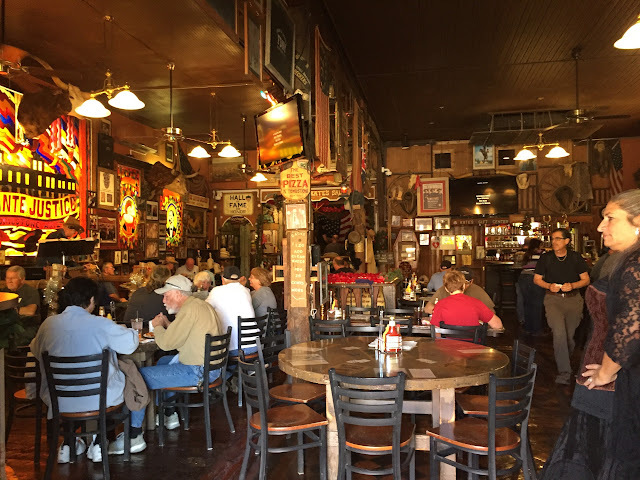 94) with a single red frame building that served as general store, post office, cafe and lodge. Continuing past the town, we drove into Cave Creek Canyon, the crown jewel of the Chiricahua (cheer-ee-KOW-eh) Mountains and part of Coronado National Forest. At the ranger station, we learned from volunteer Rick that the canyon is so famed for its biodiversity that New York's American Museum of Natural History maintains a field research station a couple of miles from the ranger outpost. THERE'S ONLY SO MUCH YOU CAN ASK, EVEN OF STEEL-BELTED TIRES. Though Rick assured us that the sporadically maintained FR-42 through the mountains was passable to Chiricahua National Monument 28 miles away, we found the unpaved track a few miles beyond the ranger station to be liberally littered with fist-sized, sharp-edged rocks, slowing us to a 15 mph crawl. Having but one spare tire and observing the road deteriorating as we climbed higher toward the pass, we decided to bail, return to Highway 80, and make better use of our time. BORDER PATROL HAD A VISIBLE PRESENCE IN DOUGLAS. The road more traveled led us to the border town of Douglas (pop. 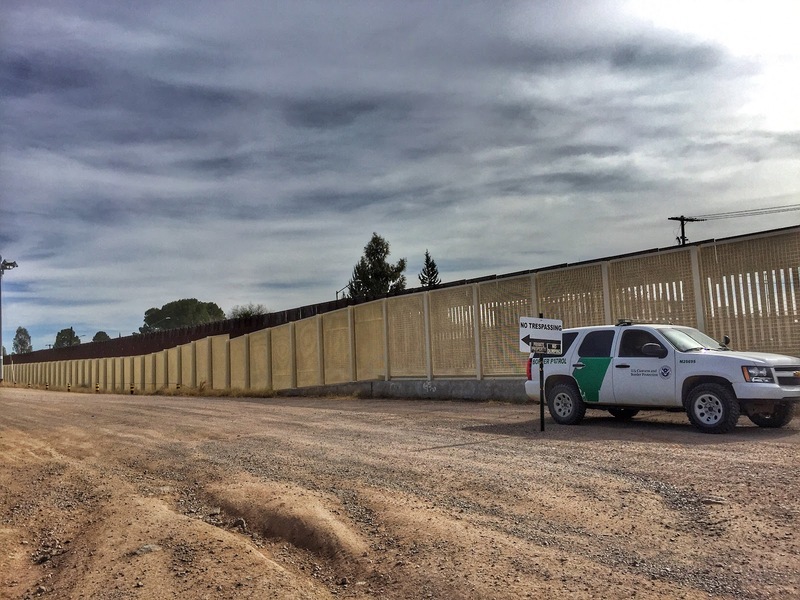 16,915), a nondescript small city whose salient feature was the 21-ft. wire mesh and steel beam fence separating Arizona from its southern neighbor. On the other side of the ditch along the border stands another wall, presumably built by Mexico. Thirty miles further west on AZ-80 took us to the fascinating town of Bisbee (pop. 5,575). 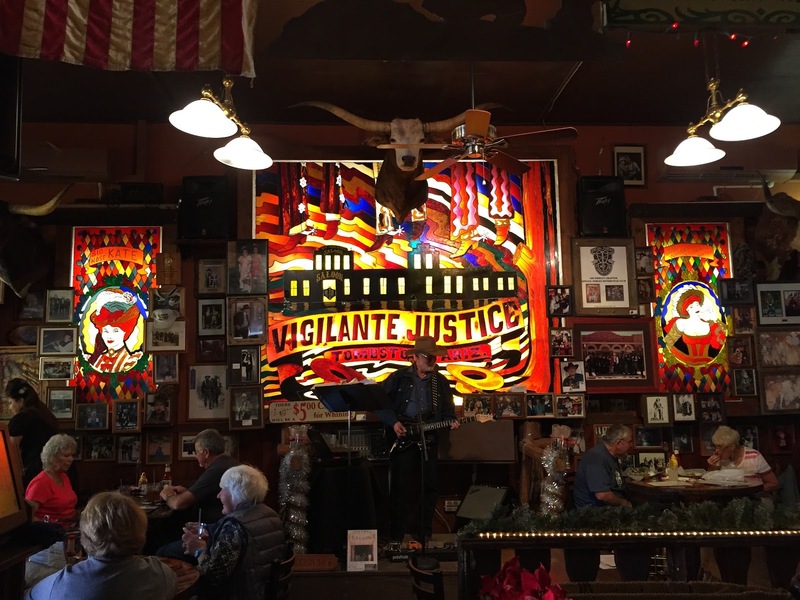 We arrived in early afternoon with the intention of visiting for an hour or so and driving on to Tucson, but we found ourselves so captivated by this quirky outpost eight miles north of the border we decided to linger longer and spend the night. The following day on our way north to Tucson we stopped in Tombstone (pop. 1,380), just 23 miles north on Highway 80. We were struck by the profound differences between the two towns, so close together and with such similar roots. Both Bisbee and Tombstone got their starts as mining camps, Tombstone in 1879, Bisbee in 1880. 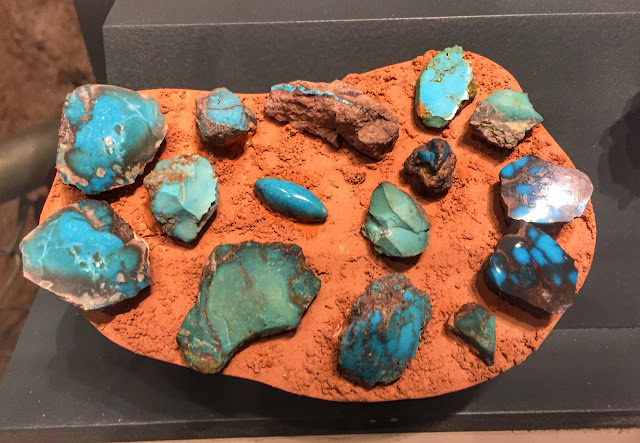 Each town had rich lodes of desirable minerals. 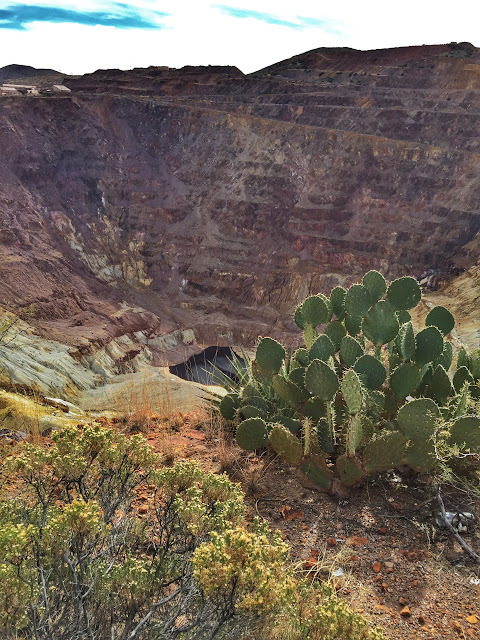 Tombstone boasted the most productive silver mines in Arizona; Bisbee had vast stores of copper as well as moderate amounts of silver and gold. Within a few years of their founding, both towns were booming. 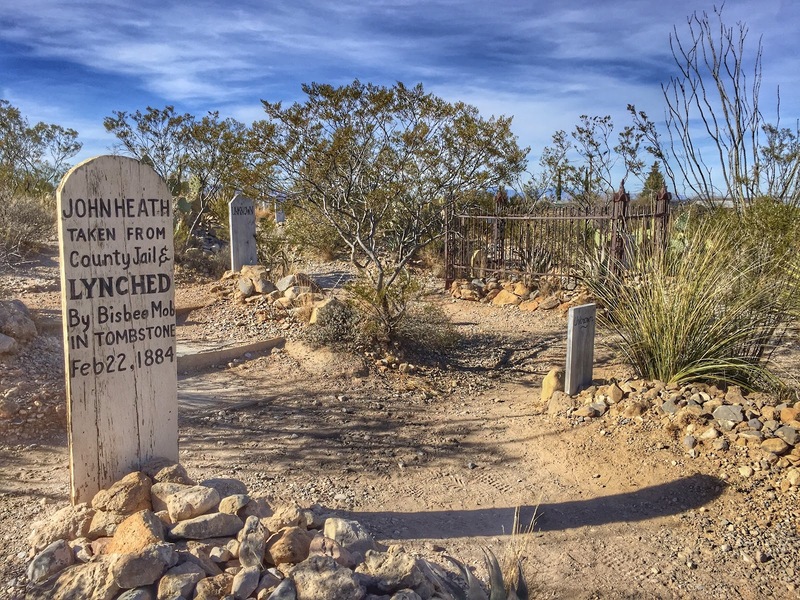 Tombstone's population had ballooned to more than 15,000, and it was designated the seat of Cochise County. 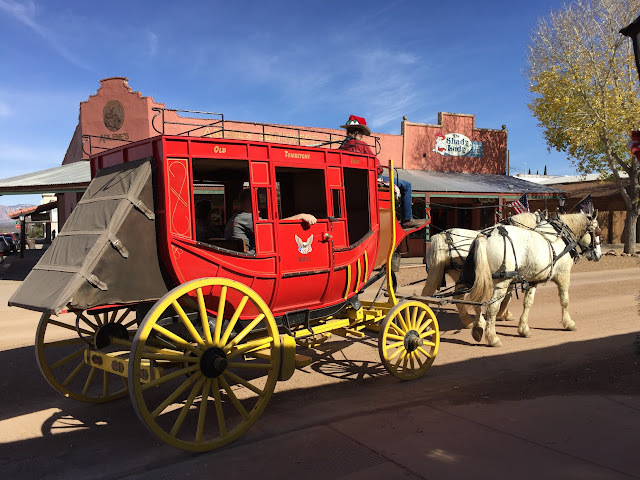 It was considered the last wide open Wild West boom town. 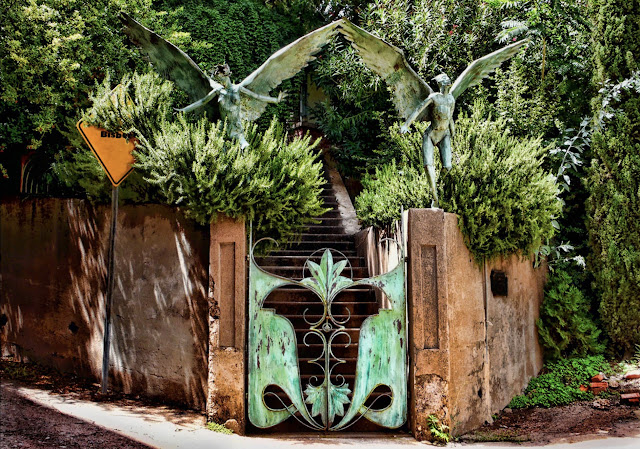 As the new century began, Bisbee, regarded as a center of culture, had become the largest city between St. Louis and San Francisco, with more than 20,000 calling it home. The economies of both cities were almost exclusively dependent on mining. 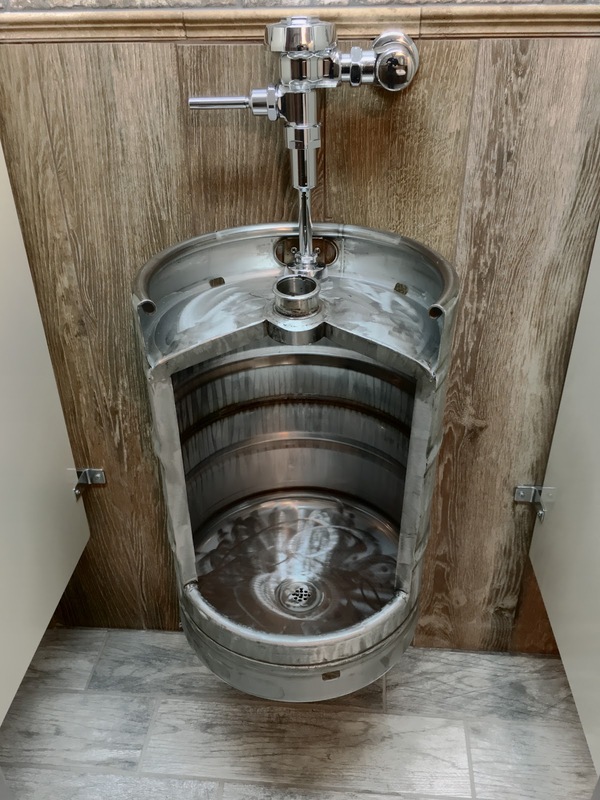 In 1887, Tombstone's silver mines penetrated the water table, drowning the mining industry there, as one pump system after another failed to keep water out of the mines. 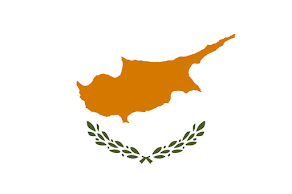 The economy faltered, and the town dried up, its population plummeting from 15,000 to 650 within a few years. 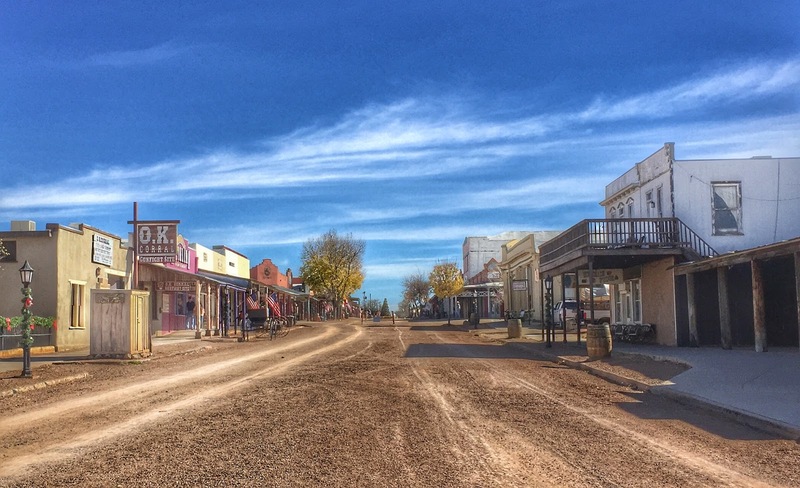 Only its status as county seat kept Tombstone from becoming a ghost town. In neighboring Bisbee, the mines continued to produce for almost a hundred years. 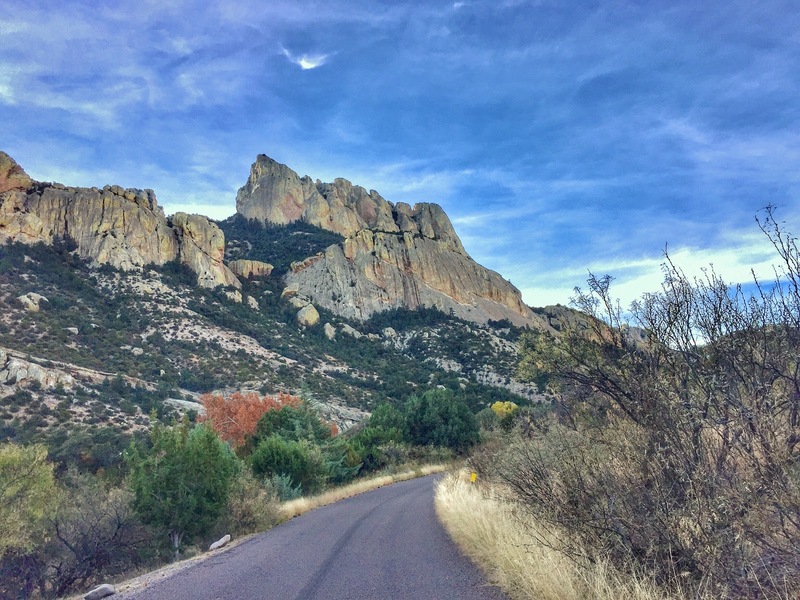 As the town prospered, the Cochise County seat was moved there from Tombstone in 1929. When underground mining became less productive, Phelps Dodge, the town's primary mining company, added open pit extraction. Not until 1975 did Bisbee's mining industry pull out of town, taking with it more than 5,000 jobs. 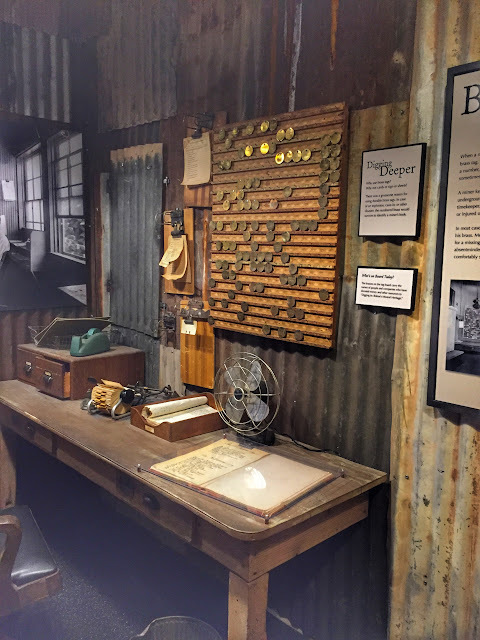 In its heyday, Bisbee had produced more than eight billion pounds of copper, but, like Tombstone, its day in the mining world had ended. And, like Tombstone, its population rapidly dwindled. 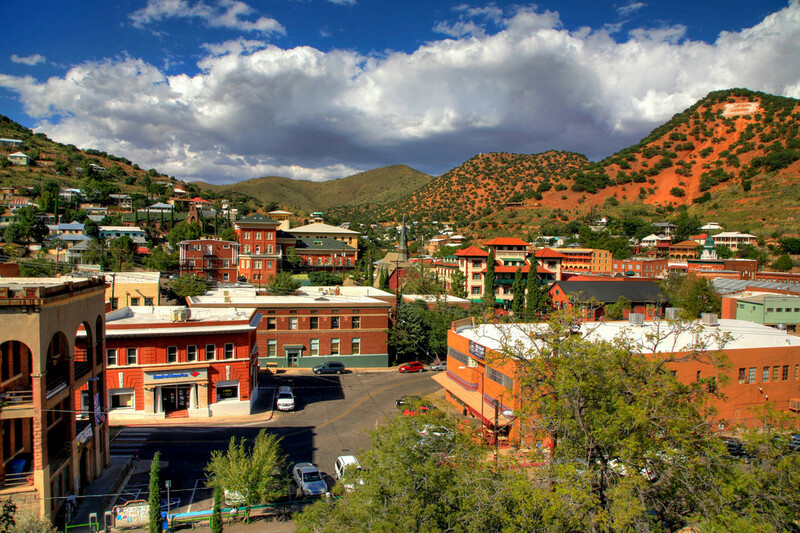 But Bisbee's longer period of prosperity, and its entrance into the modern era, gave it more to offer, even as its economy shriveled. When property values in Bisbee plunged, hippies and artists took advantage of the opportunity and moved in, restoring Victorian houses and rehabilitating the commercial district. Later, the unconventional charm these counter culture residents had infused into the town attracted other like-minded people who had been priced out of towns like Aspen, Colorado, by gentrification. Today Bisbee streets are lined with boutiques, art galleries, restaurants, antique stores, and brewhouses. FORMER MINERS ACT AS TOUR GUIDES ON THE QUEEN MINE TOURS IN BISBEE. 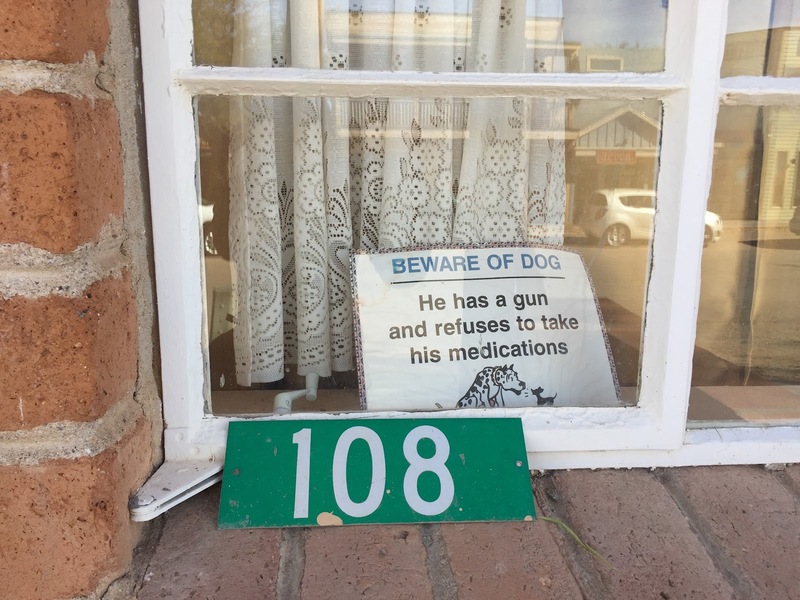 Meanwhile, Bisbee's local officials recognized the need to be proactive when the town's economy was crippled by the mine industry's departure. Seizing on the notion of heritage tourism, they worked with Phelps Dodge to shore up the infrastructure of the underground tunnels and chambers to facilitate guided tours, which began in 1976. 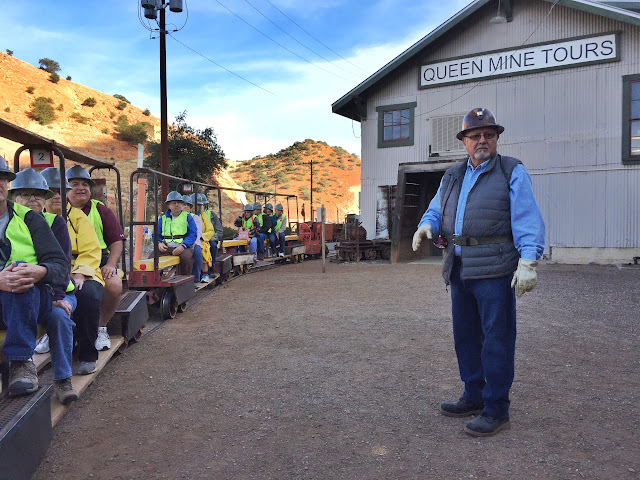 Today tours of the Queen Mine are among the most popular attractions for visitors. 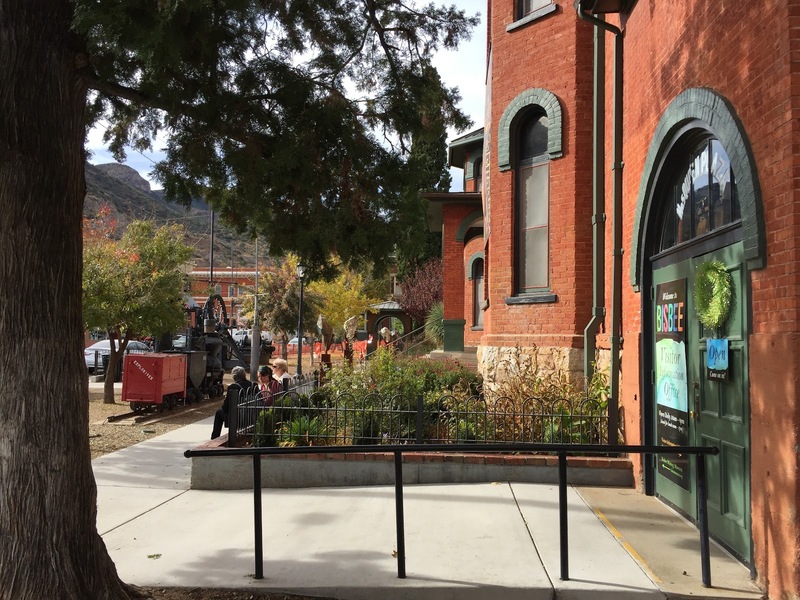 The city also persuaded the company to allow the transformation of the former Phelps Dodge Office Building into the Bisbee Mining and Historical Museum, the other top attraction in town. 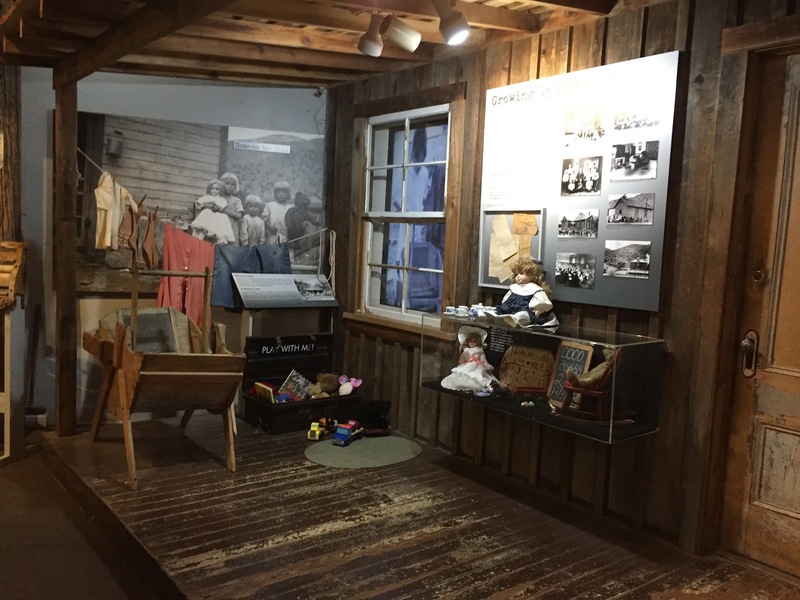 Exhibits tell the story of the town's history and detail mining methods. In Tombstone, things weren't going so well. Since the city's prime was much more short-lived, it had considerably less to draw upon. During the height of popularity of Western films in the mid-20th century, Hollywood studios keyed in on an 1881 event in Tombstone history, which has been elevated to myth status as the Gunfight at the OK Corral. Numerous movies and televisions shows have featured this 30-second shootout between lawmen of questionable repute and a loosely organized group of rancher outlaws. Tombstone locals seized on this opportunity and offer an endless cycle of ticketed re-enactments of the conflict. Tombstone managed to survive by transforming itself into an artificial version of its earlier self. Allen Street, the town's main drag, is a pedestrian-only thoroughfare with raised wooden sidewalks lining a dirt street. Local residents parade the street in period costume, encouraging visitors to patronize the many saloons and western memorabilia shops that line the avenue. WE HAD A PRETTY GOOD PIZZA FOR LUNCH AT BIG NOSE KATE'S SALOON. 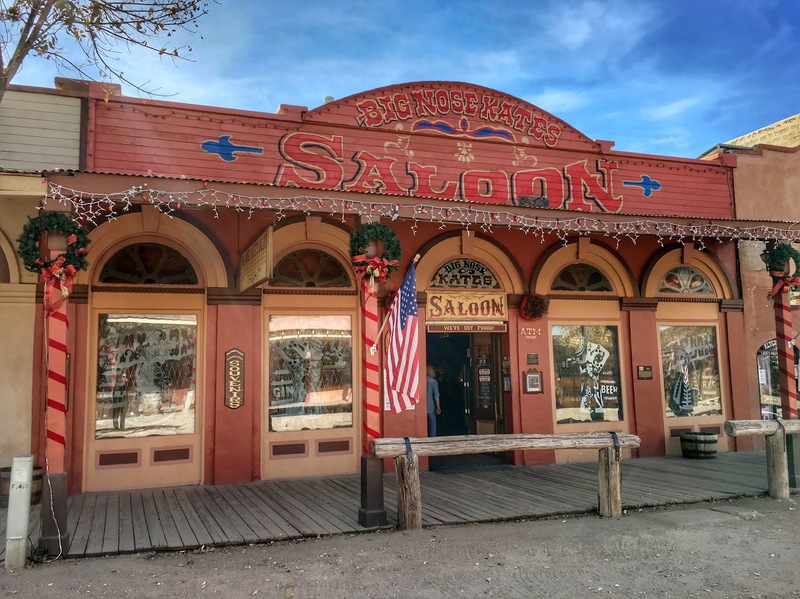 In addition to the dangers of hitching its economic wagon to the singular star of one historical event, Tombstone is dealing with the problem of a diminishing fanbase for Westerns. 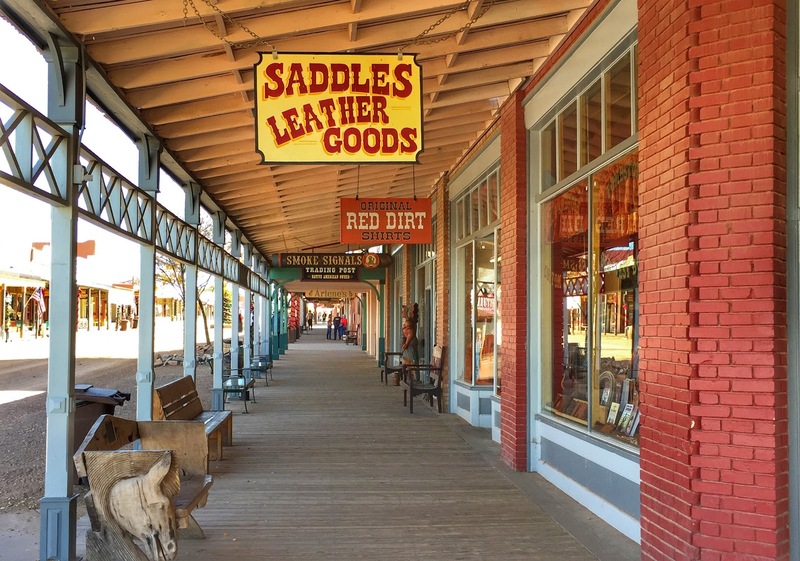 The majority of the town's visitors are aging baby boomers who grew up in an era when Westerns were a dominant genre in popular media. People of younger generations just don't appreciate the appeal of a saloon with swinging doors. Moreover, Tombstone is sacrificing its genuine historicity to facilitate tourism. 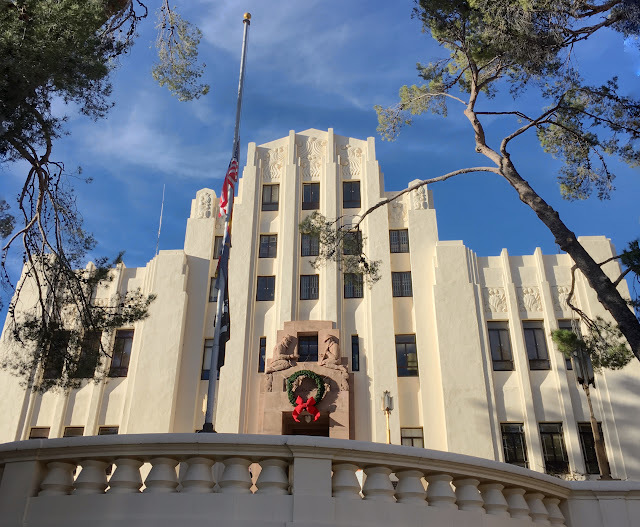 The town's National Historic Landmark status has been endangered due to decades of violating historic building preservation codes. Historic dates have been plastered to much newer buildings. Genuinely older storefronts have been painted in colors not authentic to their era. To survive, the town has become a blend of actual history and Hollywood flair, satisfying neither. 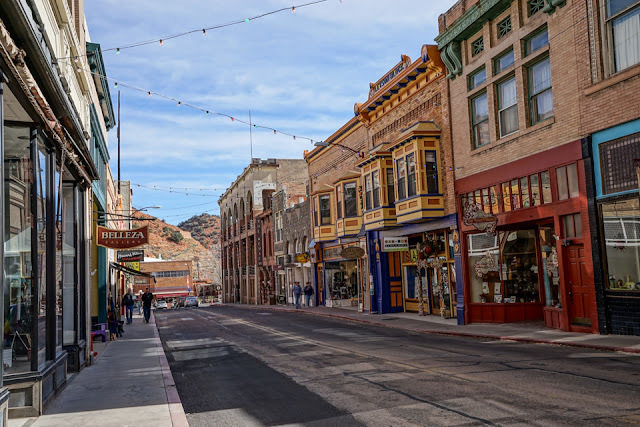 As Tombstone flounders, Bisbee was proclaimed "Best Historic Small Town in the US" by both USA Today and Sunset magazine this year. Local crafts, a thriving arts scene, and a funky Bohemian appeal have contributed to the town's appeal and its success in living up to its self-proclaimed designation as "An American Original." 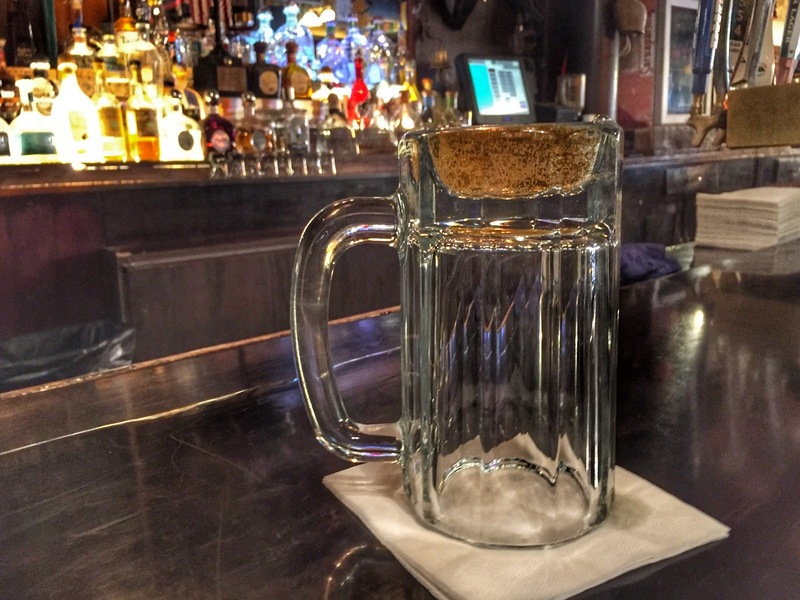 Whether Tombstone will fulfill its town motto is more uncertain: "The Town Too Tough to Die." We enjoyed both towns and especially learning about their parallel stories. We finally made it to Tucson on Wednesday. Tomorrow we'll put on the brakes and get serious about preparing and mailing holiday cards before continuing west. Loved: We really didn't know anything about these towns until we stumbled upon them when our original plan went awry. They turned out to be a highlight of our trip. Lacking: Shade. Even when temperatures seemingly aren't that high, the sun in this part of the country can fry you in a brief time. Learned: Obviously we learned quite a bit about the history of this part of Arizona and about mining in general. BISBEE MINING MUSEUM SHOWS SYSTEM TO KEEP UP WITH MINERS. BEER KEG URINAL AT BIG NOSE KATE'S. RECYCLING?? 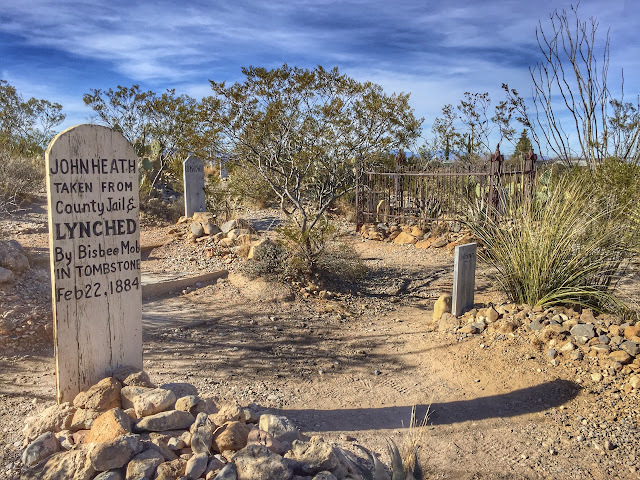 AND NO TRIP TO TOMBSTONE WOULD BE COMPLETE WITHOUT A VISIT TO BOOT HILL CEMETERY.